In this post from May of last year, I detailed the construction of a 1mW solar-powered HiFER beacon. I named it the Boris Beacon, in tribute to my neighbor’s cat. The beacon was never mounted permanently outside. 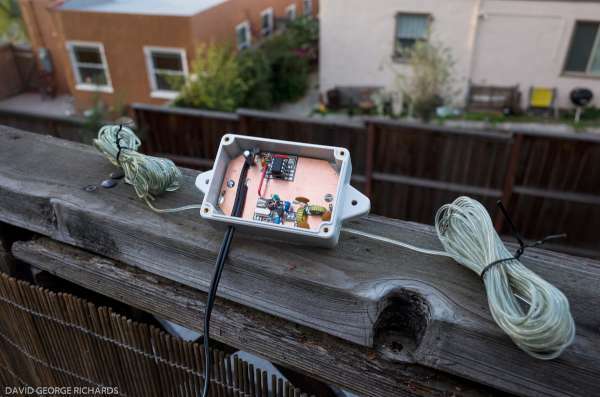 I kept it indoors, powered from a small solar panel in the window, and feeding an “antenna” of sorts, consisting of the original dipole wires folded up into two small bundles. Obviously, I had no serious intention of it being heard by anyone; I just liked having it come on every day when the sun came up, and transmitting until later in the day, when the light was too low to sustain operation. This entry was posted on Friday, January 18th, 2019 at 1:17 pm	and is filed under DIY. You can follow any responses to this entry through the RSS 2.0 feed. You can skip to the end and leave a response. Pinging is currently not allowed.